All the headlines were about Johnny Sexton following THAT drop goal with the last kick of the game as Ireland secured a dramatic victory on Paris on Saturday. But it was James Ryan who emerged as Ireland's most positive story from an average performance in the French capital. "He was born for this," said the Irish Independent's Ruaidhri O’Connor on the Left Wing LIVE in association with Aer Lingus. Luke Fitzgerald went even further. "He looked bloody great. For a Six Nations debut that was incredible Ruaidhri." "We've heard about this guy for a long time. He has been flagged as the second coming of Paul O'Connell. He looks like Paul O'Connell with possibly better hands," added O'Connor. "He is a phenomenal athlete. Ireland always struggle with the French power, he didn't look out of his depth in that regard. "He had one error but everyone is going to have an error on a Six Nations debut in Paris but overall it was so positive. "Himself and (Iain) Henderson were really dynamic. I thought Henderson was excellent, particularly in the last couple of phases. 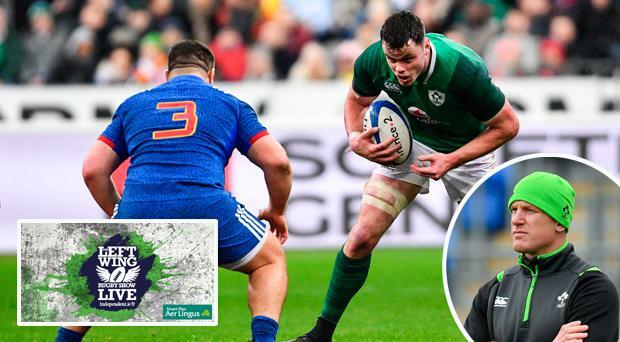 "That combination, if they can keep both of them fit, is so dynamic and so positive for Ireland in changing the way Joe Schmidt wants to play the game." Fitzgerald added: "He has got a huge amount of belief. Some of the handling…I was thinking in his first Six Nations cap. He threw on ball out the back to Johnny Sexton which kind of unlocked the French team out wide and I just thought 'that's a guy with belief'. "And that's the key part. There are loads of brilliant athletes, you come across them all the time but making the step up, that's upstairs and he has got it."